Just how do journalists’ shorthand notes stand up against other means of recording interviews as courtroom evidence? That is a question that has puzzled many a journalist, editor, media lawyer and journalism educator, particularly in countries like Australia, New Zealand and the UK where shorthand is usually required of entry level journalists. Guardian columnist Professor Roy Greenslade recently questioned its value in the modern era and gave examples of where its less than perfect use stood to damage media defendants’ cases. I worked with journalist and lawyer Jasmine Griffiths to examine this question in an article published in the latest issue of the Media and Arts Law Review ((2011) 16 Media and Arts Law Review). New technologies have changed the way journalists gather news. While the basic role of a journalist to find and report news remains unchanged, technology savvy reporters have embraced the digital age and are using technology to improve the way they operate. Using Facebook, Twitter and other social media as a source of quotes and photos. The prevalence of technology poses a unique problem to news organisations seeking to defend defamation proceedings. New technologies call for new interpretations of established rules. However, both the courts and the legislature have failed to keep pace with technological developments, leaving the legal status of some digital evidence uncertain. During research we canvassed case law and the rules of evidence to determine the evidential status of common industry practices for recording and storing information. An understanding of how evidence laws apply to journalists’ notes would allow journalists and media organisations to assess their own methods and develop better working practices to avoid the costly embarrassment of having their evidence struck out by a court. But we found it was difficult to predict how a court would determine the question of admissibility of, or in the alternative, the weight prescribed to evidence. The decision in each case falls on the facts. A journalist’s notebook may be compelling as evidence based on the fact it is likely to be the only contemporaneous record of an interview or conversation. However, even an impeccable notebook where every interview is dated and every page accounted for can be problematic for the courts if it cannot be read by an ordinary person. Quotes recorded in shorthand require translation and while it is possible an expert might be engaged, it is far more time and cost effective for journalists to provide a transcript of their notes. This is particularly so where journalists have developed their own unique or hybrid shorthand style. Some news organisations have conducted comprehensive training and strict requirements on note-taking and storage, while these practices have been largely ignored in many others. Practices also vary widely among individual journalists. This could be problematic for a media defendant’s case if a story written by a journalist whose notes did not lend themselves to being good evidence later became the subject of defamation proceedings. Traditionally when it seemed a journalist or their work might become involved in legal proceedings, whether by what they saw or heard or by what they published, their notes of interviews and associated research materials were gathered and stored in case they were required as evidence in a trial. A journalist’s notebook was viewed by the courts as compelling evidence based on the notion that records taken during or immediately after an incident or conversation were more likely to portray an accurate account of the facts than witness testimony given months or years after the event. But reporters’ notebooks were not specially valued because they were kept by journalists, more because contemporaneous notes are valued when taken by any record-keeper. Where it can be proven that a journalist (or any record-keeper) has an established system of recording information a court will likely place high value on such evidence. Former New South Wales education minister Terry Metherell’s daily diary accounts of conversations with then Premier Nick Greiner were found to be compelling evidence before the Independent Commission Against Corruption in 1992. The court will look to the methods of the note-taker and veracity of the notes, regardless of the individual’s occupation. It is not the fact that the interviewer is a journalist that adds weight – more the issues of whether shorthand speed and notebook management practices win the court’s confidence in the record of the interview. In 2004 the Mosman Daily in suburban Sydney successfully defended a defamation action brought by the proprietors of a real estate business as a result of an article about a dispute with their co-tenants sharing the premises. During the hearing the court heard evidence from the journalist who wrote the story and the tenants who had contacted the paper, along with each of the plaintiffs. Justice Hoeben stated: “I did not find (the first and third plaintiffs) to be impressive witnesses. Their evidence was at times internally contradictory and evasive… Where (their) evidence is in conflict with that of (the tenants), I prefer the evidence of (the tenants)”. The lesson for journalists who are called upon to give evidence in proceedings is that the court will look favourably upon witnesses who are honest and give a fair account of their version of events. In Field v Nationwide News Pty Ltd, a Sunday Telegraph journalist reporting on a Blue Mountains hotel that had fallen into disrepair was forced to recount her conversation with the proprietor to the court in circumstances where their recollections were very different. The trial judge concluded the journalist was more likely to be telling the truth based on the fact that she took notes of the conversation soon after it occurred, separate witness testimony supported her version of events and, importantly, she was a “credible and straightforward witness”. This indicates that even a journalist’s recollection of the contents of an interview without supporting evidence might alone outweigh the recollection of the interviewee. However, while a court may prefer a journalist’s recollection over that of another witness it may not be enough to convince a court to find in their favour. The matter of Zunter v John Fairfax Publications Pty Ltd involved a claim for defamation over an article published in the Sydney Morning Herald which suggested the plaintiff caused a bushfire by carrying out an illegal backburn. The journalist who wrote the article produced accurate notes of her conversations with the local fire chief, which were not in dispute. The problem for Fairfax was that the story had been edited at the last minute to include information provided by the photographer who interviewed the plaintiff in the absence of the journalist. The court accepted that “not being a reporter, (the photographer) did not take notes of the conversation he had with Mr Zunter” and concluded the photographer’s evidence was “more likely” to be accurate than the plaintiff’s. But the plaintiff was still awarded $100,000 in damages. One of the key principles of the rules of evidence is that any evidence adduced must be capable of being tested in court. This means that evidence will be subject to examination, cross-examination and, if necessary, re-examination in order for the court to ascribe weight to evidence and determine witness credibility. In the case of journalists’ notes, “real” evidence – that is, the physical notebook – will almost always be accompanied by testimonial evidence by the person who made the notes to provide context and translation as needed. This may indeed present the opportunity for expert evidence from a shorthand instructor on the translation of the notes. This process can be a professional minefield for journalists called into the witness box. Their practices and credibility become subject to public scrutiny among their peers, as BBC journalists Susan Watts, Andrew Gilligan and Gavin Hewitt discovered when they were called upon to give evidence at the UK’s Hutton Inquiry in 2003 into the suicide death of British defence expert Dr David Kelly after he was exposed for leaking intelligence information. During the hearing, the journalists were questioned and at times publicly criticised for their working practices, later prompting the BBC to issue new editorial guidelines on note-taking. The inquiry highlighted the importance of taking and keeping good notes. The journalists’ shorthand, longhand and hybrid notes still sit at the inquiry’s website for the gratification of those interested in the subject. As Greenslade illustrated, audio recordings of interviews and conversations are the most effective shield against accusations of sources being misquoted and, if dealt with properly, is convincing evidence in court. If a media defendant can produce an original, unaltered recording of interviews given voluntarily it will be very difficult for a plaintiff to argue against the recording being admitted in evidence. For this reason, the solicitors for Jack Thomas were unable to raise successful arguments against admitting an ABC Four Corners interview in evidence in an Australian terrorism trial. He had made certain admissions on tape in the media interview. Difficulties arise when audio recordings have been compromised or recordings destroyed before a claim or writ has been served. While in earlier times journalists were advised to archive tapes, modern day Dictaphones, mobile recording devices and smart phones are far more likely to record the contents of an interview on to a memory card, which can be difficult to preserve physically and expensive to replace. The advantage of digital recordings is that they can be downloaded on to a computer using speciality software and stored electronically. In reality, time pressed journalists may be tempted to record the quotes they need and then erase interviews in order to free up memory on their recording devices. This can have serious evidential implications. One of the key traps journalists may face in having their audio recordings admitted as evidence is where questions are raised as to the legality of the recording. Journalists may find themselves relying on recorded telephone exchanges or secret recordings of conversations in circumstances where the source was unaware they were being recorded. In most jurisdictions such recordings would be held to have been illegally obtained in contravention of surveillance or listening devices legislation. If a court follows the black letter of the law, evidence of recordings which were illegally obtained would be rendered inadmissible. This is particularly so in criminal cases where the overriding interest is justice and a person’s constitutional right to a fair trial. However, civil cases may fall within a grey area where illegal recordings may be received in evidence. It is not uncommon for journalists conducting telephone interviews to type notes of their conversations directly into the computer. Typically these notes are entered into a word processing program or recorded on screen using software employed by a newsroom to write, file and edit stories. While this method may assist some journalists in taking down conversations and expediting the writing process, it presents a challenge to journalists who are called upon to defend their stories. Often the story itself will be the only evidence of a conversation having taken place. Where notes have been preserved (i.e. the journalist saved the document in which they recorded the interview) it may be difficult to convince a court that the notes are in their original, unaltered state. The potential problem with electronic records of interviews was raised in the Hutton Inquiry. Journalist Andrew Gilligan told the Inquiry that soon after an informal meeting with a defence official he recorded his recollection of the conversation on a personal digital assistant for later use in a story. While ordinarily such evidence might be regarded highly because of its contemporaneous nature, in this case it was suggested he had later amended the notes when it became clear he would have to produce his notes to the inquiry. As a result, two forensic computer analysts were called as expert witnesses to testify as to the reliability of the records at great expense and embarrassment to the BBC. Lawmakers have sought to clarify the status of electronic evidence by introducing statutory provisions dealing specifically with computer-produced evidence. While emails may be saved or archived, the same cannot always be said of more transient forms of communicating such as text messages on mobile devices or information gained from social networking sites. Facebook and Twitter provide fertile ground for journalists seeking information about a source. However, the ephemeral nature of social networking combined with the ability of users to control the information that is shared publicly may present a problem for journalists who publish information gained via such means. In these circumstances, a prudent journalist may print off the relevant information or store it in some other permanent form. In addition to keeping good notes of interviews and conversations, journalists should keep a record of phone calls and other attempts made to contact a source or verify information before it is published. In order to establish a defence of fair comment, honest opinion or qualified privilege in defamation proceedings, a journalist must prove good faith. This can be difficult to prove without evidence to support the claim that a journalist acted fairly. The statutory defence of qualified privilege will also require evidence that a journalist at least made an attempt to provide a balanced story. Section 30 of the Defamation Act 2005 (NSW version, but nationally uniform) states that when deciding whether a publisher’s behaviour was reasonable in the circumstances “a court may take into a range of factors including whether a reasonable attempt was made to obtain and publish a response from the individual being defamed and other steps taken to verify the information published”. In other words, the Act effectively imposes record-keeping obligations on journalists who may wish to use the defence in potential legal proceedings. However, many journalists are unaware of these requirements until after the fact, at which point a lack of evidence may preclude them from successfully arguing a defence. A basic understanding of the rules of evidence by news organisations and individual journalists would assist reporters and their editors in developing improved newsgathering and information storage practices. While there are sometimes safety nets for journalists who have had less than meticulous note-taking and file storage practices, news organisations and tertiary programs should be emphasising best practice in notebook and file management and imbuing journalism students and graded reporters with the importance of preserving records of interviews. While jurisdictional differences in evidence law might impact on the advice given by media lawyers, it should be sufficient for journalists and their news managers to understand the basic principles and incorporate them into their daily newsgathering and file management practice. 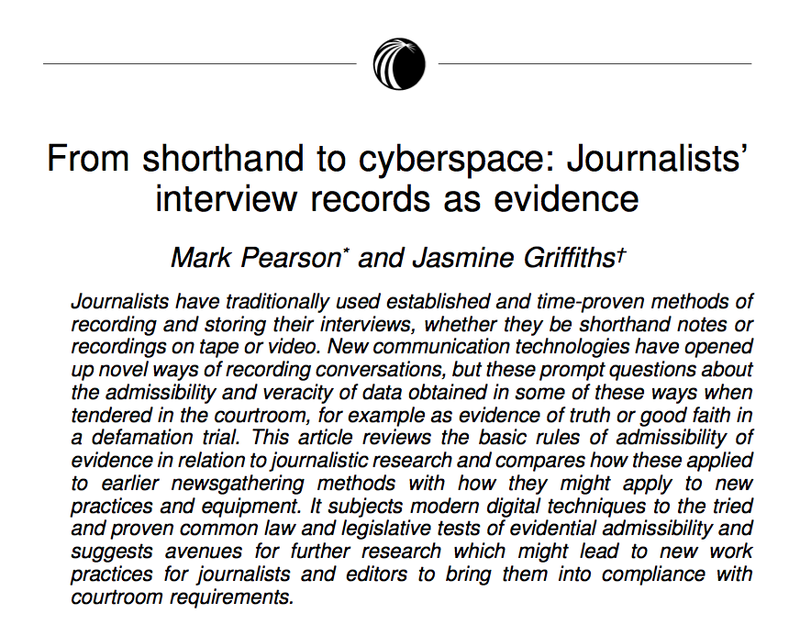 The challenge to journalists, their managers and their lawyers is that the laws of evidence are complex and remain unsettled, particularly in respect of technology-based evidence. As a result, it is difficult to anticipate how a court might receive a journalist’s evidence where new methods and technologies have been applied in practice, particularly if suitable records have not been kept or if some of the information has been obtained in breach of other law. It would certainly be premature to call for the elimination of shorthand from industry entry requirements. However, media outlets need to look carefully at their double standards. Newspaper companies insist upon 120 words per minute of shorthand for entry level recruits but do not apply the same requirement to the experienced reporters they hire and sometimes waive the shorthand speed for star rookies who excel in other areas. It’s a little like a commercial airline poaching obese and sickly pilots from its competitors while insisting its entry level pilots pass a rigorous fitness test. Whether or not they continue with shorthand, media outlets need to look carefully at their collection and storage of interview records in whatever format, and to train their staff in basic protocols for the recording and filing of interviews. Food for thought. Students using Facebook extensively in a recent Foreign Correspondence course to get comments from overseas cut and pasted Facebook chat into their appendices. Legality? I once got the tycoon John Singleton off an assault charge in Adelaide when I witnessed his arrest in a bar and wrote notes, including coppers’ serial number, in my notebook in Greeg shorthand. I re-read this in court and the Pitmman’s shorthand offial allowed me to transcribe my Greeg’s because I was left-handed and couldn’t do the heavy and light strokes of Pittmans. On another occasion as publisher of the PNG Post-Courier I was dragged before a judge with my best reporter who ACCURATELY reported an obscene comment in a heated court argument by the judge in his notes. The judge changed the transcript and charged us jointly with contempt. We were remanded indefintely and it was never settled… apart from an extortion attempt by the corrupt judge. A tape recording would have saved us in that case….